No matter which city you are in these days, driving can be quite a pain. Lawlessness on the roads, the flawed lane system, and bikers rushing past like water through a crevice — it’s just a matter of time before you end up in a bad situation on the road. Whether an accident is your fault or someone else’s, it’s good to have the facts straight. That’s why dashcams are invaluable these days. Selecting the right one is a process in itself. There are a number of options in the market across price brackets, but a lot depends on what your particular needs are. Do you need a straightforward dash cam, or are you looking at more options, like car security? The Blaupunkt DVR 3.0 FHD packs an arsenal of features that makes it stand out in a crowd - at least on paper. But how does it perform in the real world? Let's find out in our review. Unlike its car audio solutions and even headphones, Blaupunkt’s DVR 3.0 FHD doesn’t quite have the same visual finesse. It seems quite cheap overall, with a plastic casing that doesn’t feel very sturdy. Then there are the flimsy buttons that almost creak when pressed, and the low-resolution, low-contrast display. The lack of a touch screen and poor controls for navigating through the options make it feel like this product doesn’t really belong in 2017. The front of the unit has its protruding lens, which is 140 degrees wide and has a f/2.2 aperture. There are speakers on either side of the lens for use when playing your recorded footage. 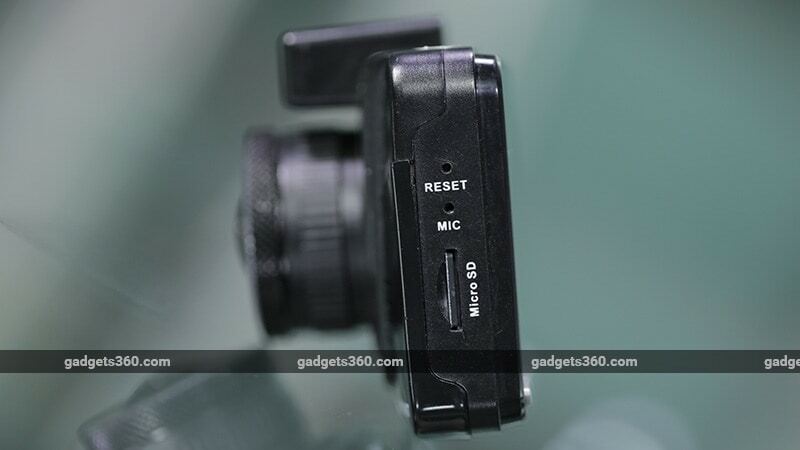 On the left is a mic input, a microSD card slot and a reset button, and the right has the Mini-HDMI output and power button. The back of the DVR, which is the part you’ll be seeing most of the time, has a 2.7-inch LCD screen along with the menu and multifunction buttons. Finally, you can find a Micro-USB port for charging and data transfer (USB 2.0) on the top. The Blaupunkt DVR 3.0 FHD comes with a small suction cup mount which has a ball-and-socket joint, allowing you to angle the camera to any position you like. If you haven’t used a dash cam before then you should understand that they tend to obstruct your view no matter where on the windshield you place them. We ideally advise placing yours behind the rearview mirror, but then if you ever need to plug in its charging cable while driving, that could be a bigger nuisance. It’s just how dash cams are, and this one’s no different. That said, the suction cup that came along with the Blaupunkt DVR 3.0 FHD was high quality and it stayed firmly attached to our windscreen despite all the bad roads we drove over. The device also comes with a Micro-USB car charger which has a generous cable length. The Blaupunkt DVR 3.0 FHD does pack in a good number of features. 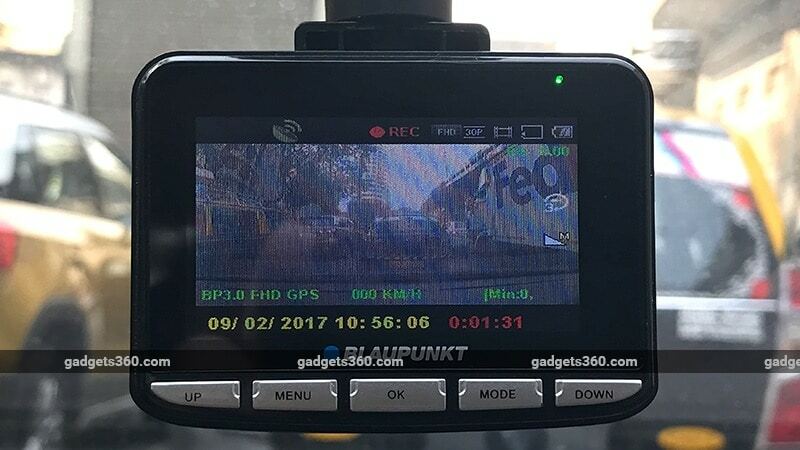 It records video at 1080p 30fps at a very wide angle, which covers everything that’s visible through your windshield and sightly more. The mount gives you the freedom to turn it around, so if you’re ever in the mood to record your in-car karaoke sessions with friends, you can. The camera records in a loop, so your oldest video file gets overwritten once the microSD card runs out of space. For testing we set the recording time per clip to 3 minutes, at the highest quality and resolution settings (1080p, Super-Fine), which resulted in AVI files of roughly 335MB each. You have the option to set the recording time to 1 minute or 5 minutes per clip as well. Besides its basic functionality, the Blaupunkt DVR 3.0 FHD also gives you some pretty interesting features. The first is motion detection, which means that the camera can automatically start recording when it detects motion. You can set the sensitivity to low (camera starts recording every time the car is in motion), medium, or high(recording starts only when an impact is detected). We wouldn’t recommend setting that to high, since recording only the aftermath of an accident might not be very useful. Another feature that sounds great in theory is parking monitoring. You can leave the camera on standby inside your car, and it is supposed to start recording every time it detects someone move in front of the car. We say great in theory, because the feature never worked despite multiple attempts during our test period. The Blaupunkt DVR 3.0 FHD uses GPS to store coordinates in each recorded file’s EXIF information, in case you need to establish where a particular clip was recorded. The quality of recordings was pretty good. Footage taken in the daytime was quite crisp and well exposed overall, and the camera was stable enough to not add any jitter to the footage when driving on bad roads. Even at night, the camera picked up number plates well, and made the most of the available lighting. 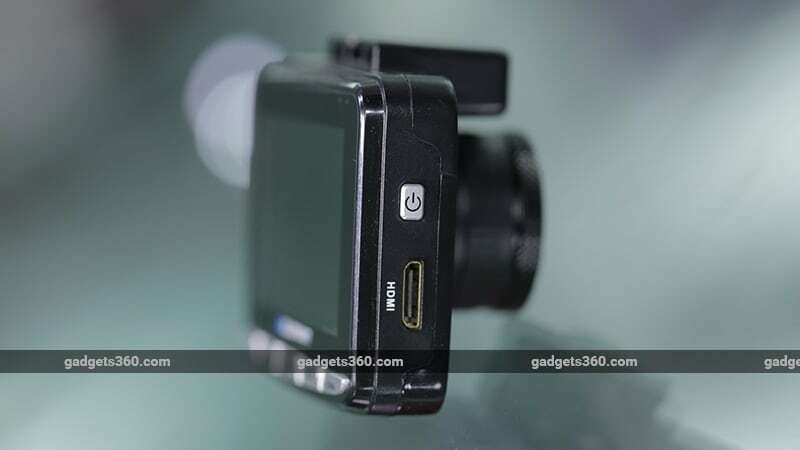 The overall camera quality is what we found to be the main differentiator between the Blaupunkt DVR 3.0 FHD and cheaper no-name brands available in the market. Battery life while recording was close to an hour, which isn’t a lot. However, with dashcams, standby time matters more than recording time, since they can be plugged in to your car’s battery. There’s an LCD Power Saver mode which would give you more recording time. There’s no doubt that the DVR 3.0 FHD could be an extremely useful car accessory, especially if you have to deal with bad traffic regularly. However, considering that we couldn’t get the parking monitor to work, and taking the unimpressive build quality and UI into account, we just can’t recommend this product. For Rs. 12,490 you’d certainly expect a level of finesse, which you won’t find here. If you want a dashcam that just works, there are a number of alternatives available at a fraction of the cost of the Blaupunkt DVR 3.0 FHD.